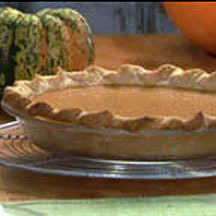 When the season of autumn rolls around, you know it's time for pumpkin pie! Combine eggs, pumpkin purée, sweetened condensed milk and pumpkin pie spice and mix well. Pour the mixture into a pie shell. Bake for 15 minutes at 425°F (220°C). Then reduce the heat and bake for 35 to 40 minutes longer at 350°F (175°C).